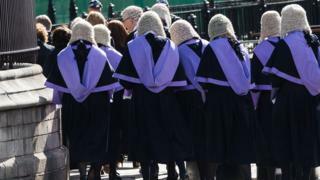 Judges handing sentences to criminals with mental illnesses or learning difficulties will have to follow specific guidelines for the first time. New draft sentencing guidelines are being issued in England and Wales to ensure that courts are fair when deciding how responsible mentally ill offenders are for their crimes. It could see some offenders with mental disorders receive lighter sentences. One charity called it a "big step" for the justice system. The draft new guidance from the Sentencing Council for England and Wales applies to offenders who are aged 18 and have conditions such as learning disabilities, schizophrenia, depression, post-traumatic stress, dementia and disorders resulting from drug or alcohol misuse. Did the individual's condition impair their ability to exercise appropriate judgment, make rational choices or think clearly? Did they seek help, and fail to receive appropriate treatment or care? Were there any elements of premeditation or pre-planning in the offence? If the offender exacerbated their condition by drinking or taking drugs, were they aware of the potential effects of doing so? The new guidance does not aim to change sentencing practice but instead provide judges and magistrates with a "clear structure" to follow. And just because an offender has such a condition or disorder does not necessarily mean that they will receive a different sentence, the draft guidance says. It explains: "In some cases the condition may mean that culpability is significantly reduced, in others, the condition may have no relevance to culpability." Judge Rosa Dean, a member of the Sentencing Council, said: "The offender's mental health is just one element that the courts must consider, and the guideline strives to balance the rights and needs of offenders with protecting the public, the rights of victims and families, and their need to feel safe." And Lucy Schonegevel, from the charity Rethink Mental Illness, said: "This is a big step towards the justice system having a better understanding of mental illness, as it's the first time there will be specific sentencing guidelines in this area." The Sentencing Council said data suggests that people in the criminal justice system are more likely to suffer from mental health problems than the general population. According to a 2017 report, nearly one quarter (23%) of inmates arriving at prison had previously been in contact with mental health services. A Ministry of Justice spokesman said: "It is vital the courts have clear and consistent guidance in these often complex cases, so that an offender's mental health is addressed and the public kept safe." The draft guidance, which is subject to consultation, must be followed unless a judge or magistrate considers it is not in the interests of justice to do so. It will be used alongside current guidelines, which exist to ensure that sentences are consistent across different courts. The Sentencing Council has a range of guidelines on different factors. Currently, pre-sentence reports are compiled for offenders, which can help the court decide which sentence to pass. Rethink Mental Illness charity says these can include information about mental health problems or drug and alcohol issues, for example.